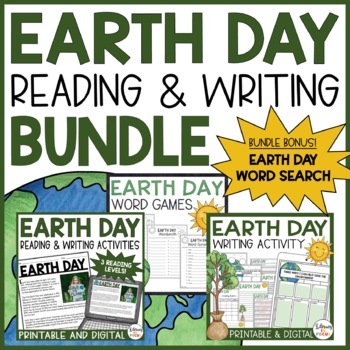 The ultimate Earth Day reading and writing activity bundle! 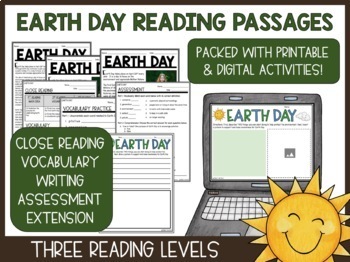 Differentiated Earth Day reading passages and writing activities are included! BUNDLE AND SAVE $$$! Earth Day differentiated reading comprehension passages with vocabulary support and writing activities! Everything you need to celebrate Earth Day without missing out on instructional time is included and ready to go! Differentiated Reading Passages: The differentiated reading passages are focused on the history and relevance of Earth Day. Advanced, intermediate, and beginner reading levels are included. The corresponding Lexile and grade levels are shown below. Close Reading Directions: Your students will read the text three times, focusing on main idea, vocabulary, and text-based evidence. Differentiated Vocabulary Support: A divided circle map is included to support students in learning the meaning of several tier two and tier three vocabulary terms included in the text. The vocabulary support pages are also differentiated (advanced, intermediate, and beginner). Vocabulary Activity Worksheet: A worksheet is provided for students to practice and apply the vocabulary terms. 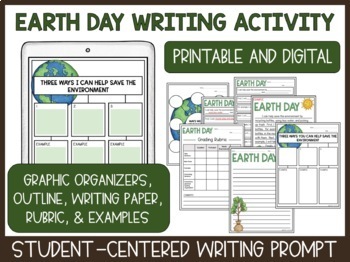 Writing Activity Worksheet: Students have a chance to connect the reading to their own lives by describing two things they can start doing to help protect the planet. Space for an Earth Day illustration is also included. Differentiated Assessment: The three-part assessment is based on the informational text and covers vocabulary, comprehension, and includes a short answer extension question. A separate assessment is included for each reading level. Answer Keys: Answer keys are included for the divided circle maps, vocabulary activity worksheet, and assessments.